Love it Lucy! Just love your background! I love it!! It's something I will definitely try. Thanks for the inspiration. Fantasic! I love the popped up butterfly. The colours are beautiful and I love all things butterfly ! What a fantastic idea and execution! Love it! Wow, this is so amazing! 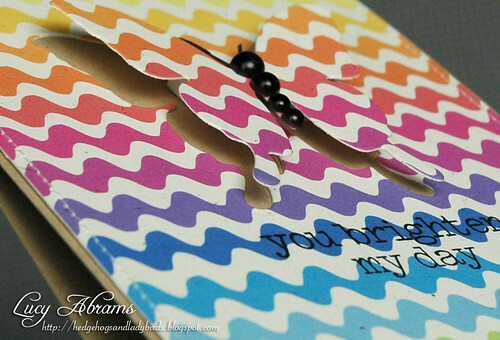 I'm just wondering what die cuts I've got that would work with this type of card! I love this card! the vibrant colors and clean lines are fabulous. So fun and creative Lucy! What a beautiful effect this has, Lucy! The bright colors are wonderful! Just love it! So simple, yet such a great idea with a great effect. Thanks for sharing! Love how this turned out, Lucy! Wow, Lucy! I found this card on Pinterest and had to come to take a closer look. :-) It is so beautiful, absolutely stunning. Love it ! 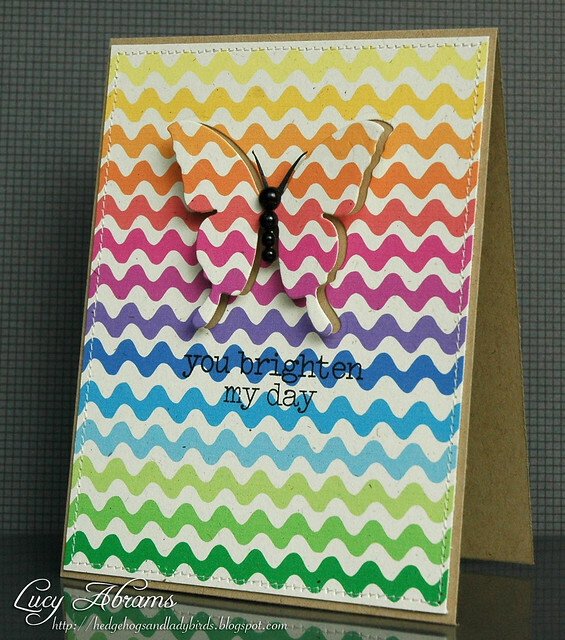 Such beautiful bright colours..the receipient of this card would be sooo delighted ! Oh wow this is a neat card! This is beautiful. The colors are so vibrant and I love that butterfly popping out. Thanks for sharing. That's quite a brilliant idea! Love that card! Wow, are they all memento inks? I thought it was printed CS. Gorgeous! Brilliant card, and such an eye catching technique!!! oh my holy WOW!!! this is awesome! !